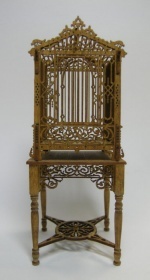 An exquisite victorian birdcage and coordinating table. 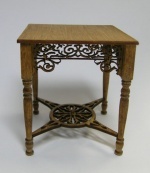 Finely cut by laser, both pieces feature extensive fretwork and delicate scrolling. Cage measures 2" x 2" x 2 1/2" high. Table measures 2 1/4" square by 2 1/2" high. Table can also be used as a game table. Easy to assemble, cage has only 9 pieces and uses tab and slot construction cleverly hidden in the fretwork design. You will need Xacto knife, glue and emery board. 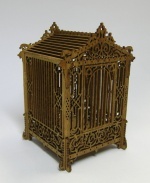 Cage and table are available separately, or can be purchased together at a special introductory price.